Customer Success is a relatively new discipline in the Software-as-a-Service world. Consequently, there are many unanswered questions about how best to build and manage great Customer Success teams for SaaS companies. Because the financial impact of a great CS team is compounded monthly and can meaningfully increase the growth and decrease the cash needs of SaaS startups, it’s critical for CS leaders to get it right. Last night, I attended a dinner with many heads of Customer Success from prominent valley SaaS companies. We spoke for quite a while about the best way to structure and motivate Customer Success teams to balance customer care and account growth. One VP of Customer Success described an innovative approach to managing this balancing act. The diagram above entitled the “Performance CSM Sales Motion” captures her team’s sales motion. First, the sales team engages and signs either a pilot or full contract with a customer. Second, an account manager, tiered by customer size, engages that customer through the initial deployment. As time passes and the customer’s usage of the product grows, a third person becomes involved: the up-salesperson. Around the time of the customer’s renewal period, the up-salesperson begins a new sales process to grow the account, and the account manager disengages during that process. Ideally, the up-selling process is successful and then, the motion repeats. The account manager ensures a happy and successful customer and the up-salesperson intervenes again when product usage spikes and during renewal times. If not, the account manager picks up the account and the up-sales process is tried again later. To enable this type of sales motion, this VP of Customer Success structured her team differently than most Customer Success organizations I’ve seen. 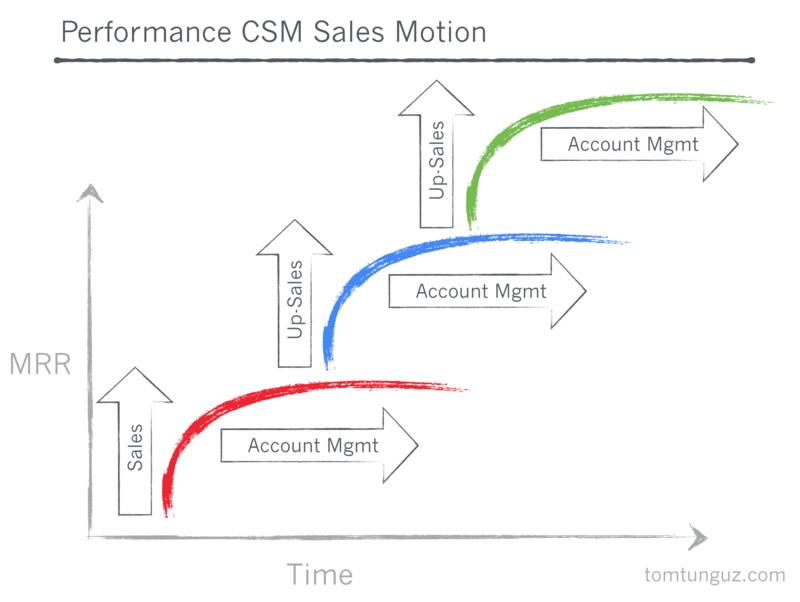 Traditional Customer Success Management, depicted above, has the quota-carrying salesperson transferring a post-sales customer to a non-quota carrying customer success manager, who is responsible for account management ad account growth. Some companies do create a small up-sell quota for the CSM, perhaps 10-15% of their compensation. But many do not. 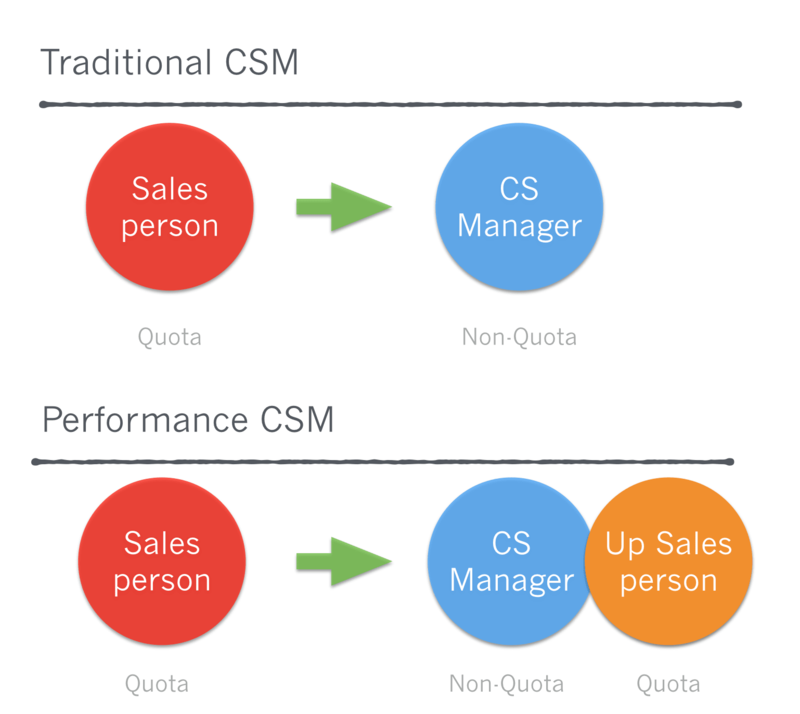 The Performance CSM model adds a third person belonging to a third team, the Up-Salesperson on the Up-Sales team. The Up Sales Person carries a quota and is compensated with a sales structure, while the CS Manager is salaried. By splitting the responsibility of customer care/happiness from up-selling responsibility, this VP of Customer Success has been able to build a team that both satisfies customers and grows accounts effectively. Also, the Up-Sales team is structured and managed in an identical way to the Sales and the CS team, which could be by region or by product/solution or customer account value. This is important because it builds strong relationships across departments, since the same Sales, Up-Sales and CS members work together and provides a consistent experience for customers. As the number of SaaS companies increases, and their sophistication in serving customers deepens, I expect to see refinement of the Customer Success model. Today, there aren’t many wide-spread best practices. But techniques like the Performance CSM model are big steps in that direction.